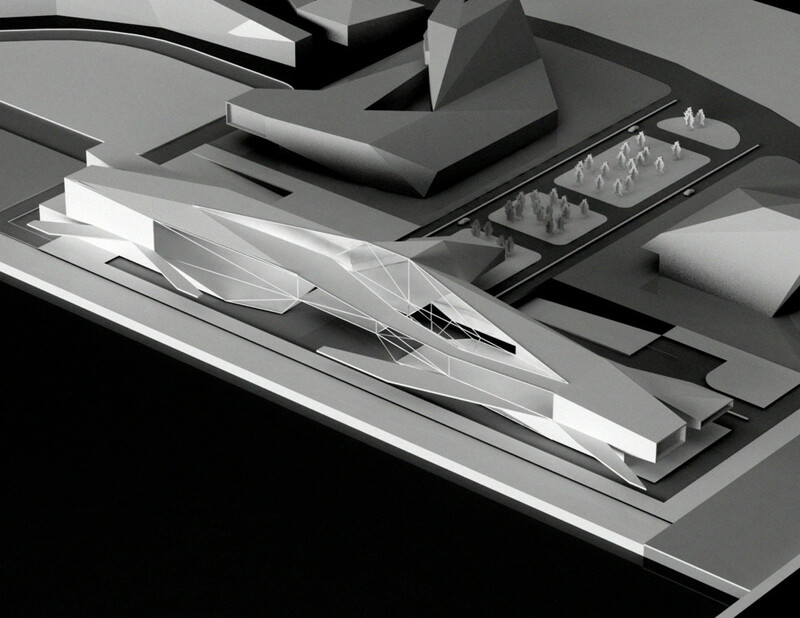 URBAN CONCEPT The Architectural Concept for the Kinmen Passenger Services Terminal is that of a Gate into the city. The Building ARCHES over the Park and lets it extend it underneath so that the City and the Sea are connected through the Terminal building. From the Park, citizens can see the water and Marine activities. From the boats, passengers glimpse into the city. 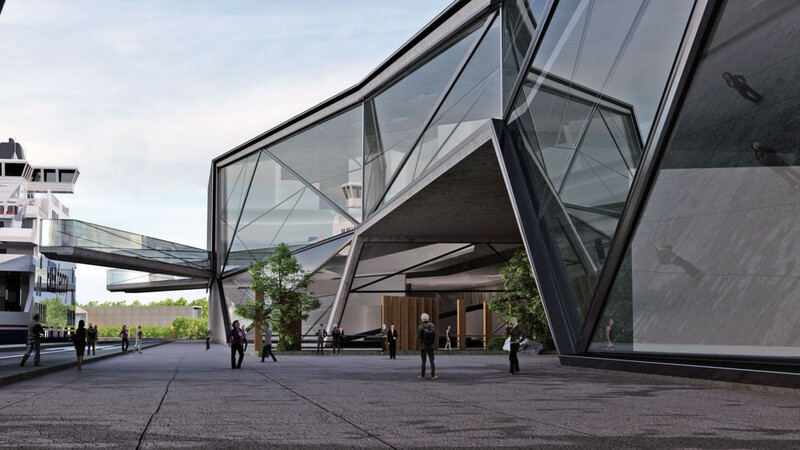 This creates a lively and “porous” interaction between the Terminal Building and the larger Master Plan. 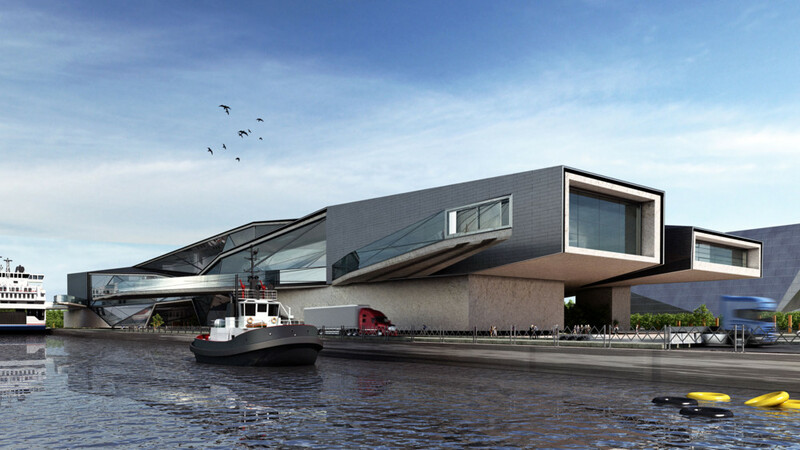 As a portal, the Building integrates into the waterfront landscape and green spaces, rather than acting as a blocking element between the land and the water. The vehicles’ TRAFFIC pattern is thus re-routed into an UNDERPASS that let’s cars arrive to a large parking area under the building, alleviating heavy circulation on the ground floor. 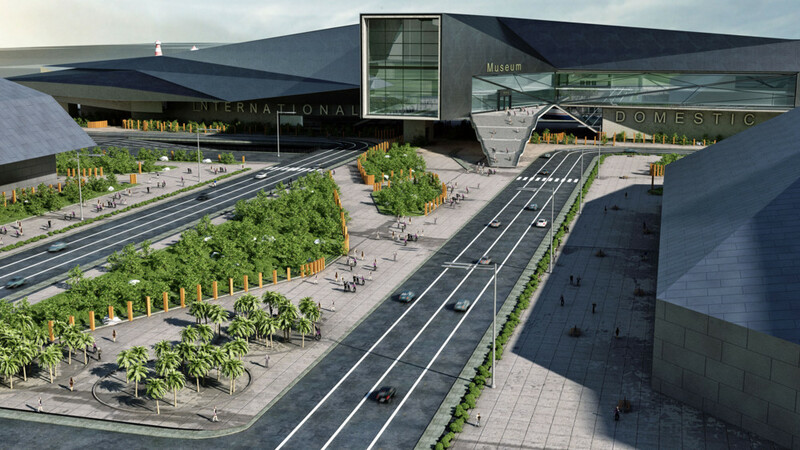 The underpass also proposes covered access to the adjacent Shopping and Duty Free Building and the Hotel and Convention center building. From the lower parking area visitors can take escalators to the main COVERED PIAZZA underneath the building or elevators directly to the Domestic or International Wings. The covered Piazza becomes essentially a public space, a gathering space for visitors and citizens alike. It could for instance become an ideal place for a Night Market or informal outdoor performing space. Access to the Domestic and International Wings is also allowed at the ground floor via drop off for cars, taxis and buses, as well as pedestrian access. 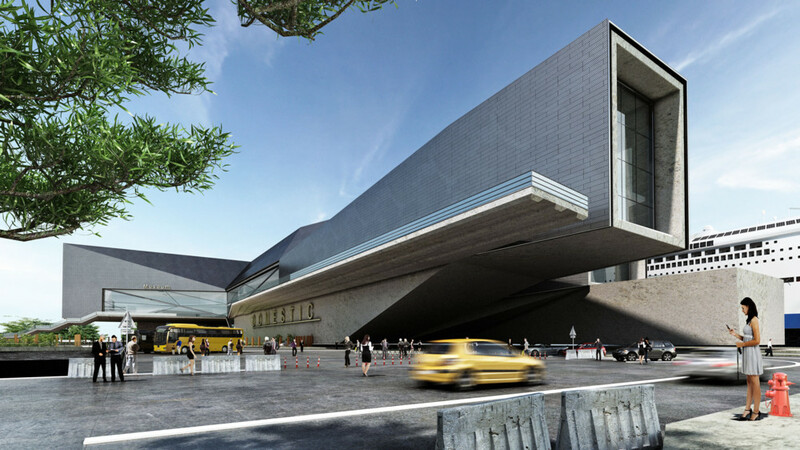 Each Wing is located to each side of the Central Covered Piazza, forming a more distinct and organized flow of passengers. Arrivals are located at the ground level for both Domestic and International wings. Departures are located on the second level (level +12m) for both Domestic and International wings. Direct access to the Departures occurs via the Covered Piazza through escalators or Elevators, or via each wing thorough elevators. 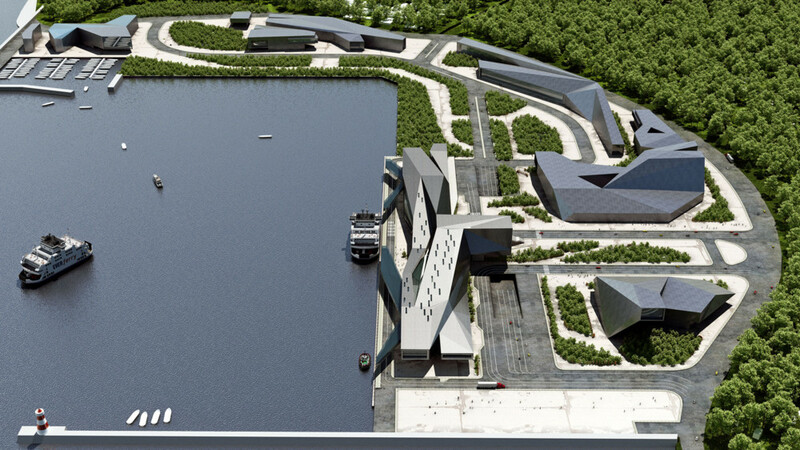 The third Main Architectural element is the Kinmen Maritime Museum and Gallery Center. 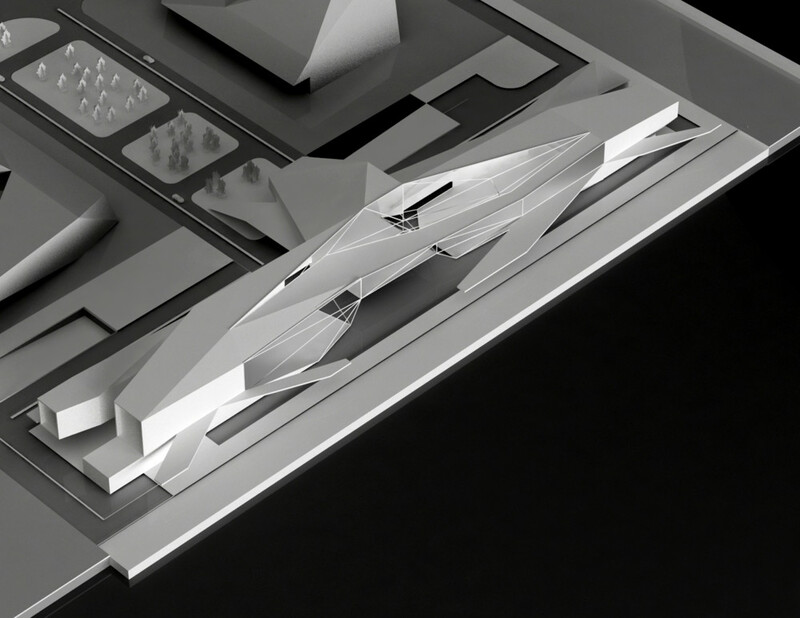 The Museum is an extension of the Terminal itself and extends as large Volume “hovering” over the park. It contains exhibition and gallery spaces as well as a café and an auditorium looking out to the park. The Museum provides entertainment for the Passengers and education about the city of Kinmen both Past and Future, via ongoing shows and lectures/films/documentaries. 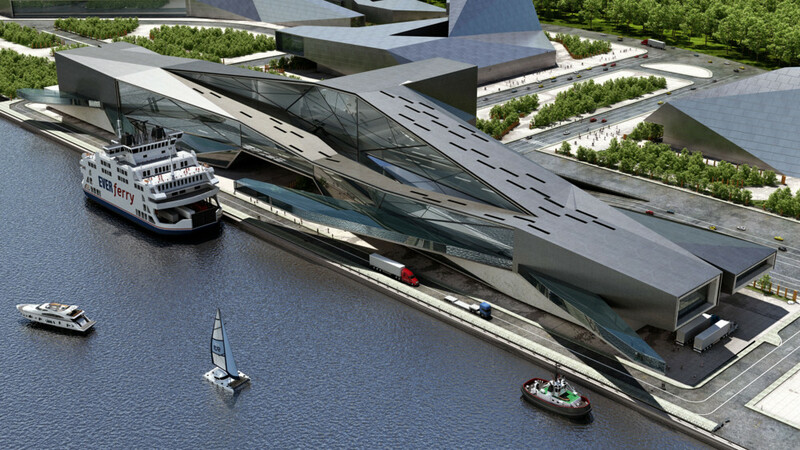 Simultaneously it provides the city with a place to visit and learn more about Maritime business and history. ARCHITECTURAL DESIGN The Building Design is driven by the “arching” movement of the volume over the extended Park/Piazza, whose wave reverberates through the exterior skin and shapes the exterior volumes and internal programmatic requirements. The idea of duality (Left and Right, Domestic and International Wings, Park side/Sea side, Arrivals/Departures ) is carried through the building form as it shapes the interior spaces. In particular the building is split by a longitudinal “spine” which organizes a north and south section. The north areas favor the Sea side and host the waiting areas and departures gates, the south areas host all public functions (shopping, retail, offices) and access to the Museum component. The longitudinal spine is created by a “Glass Canyon”, which brings natural diffuse light to all levels of the building, yet emphasizes the tall space of the Arrival Halls. 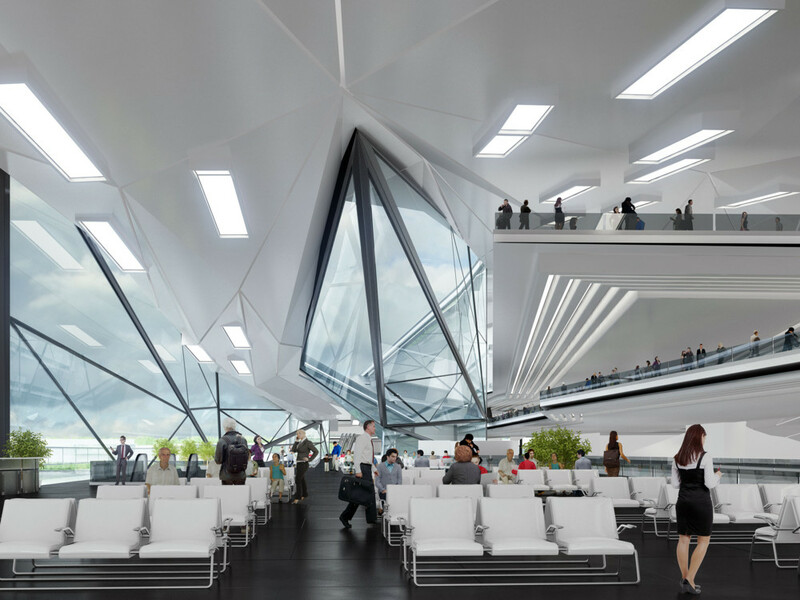 Conceived as an environmentally friendly building the Terminal has large glass openings to the north side and a smaller amount of glass on the south side. This will increase the amount of diffuse light within the space (thus reducing lighting and cooling consumption) and limit the amount of over heating from direct southern exposure. 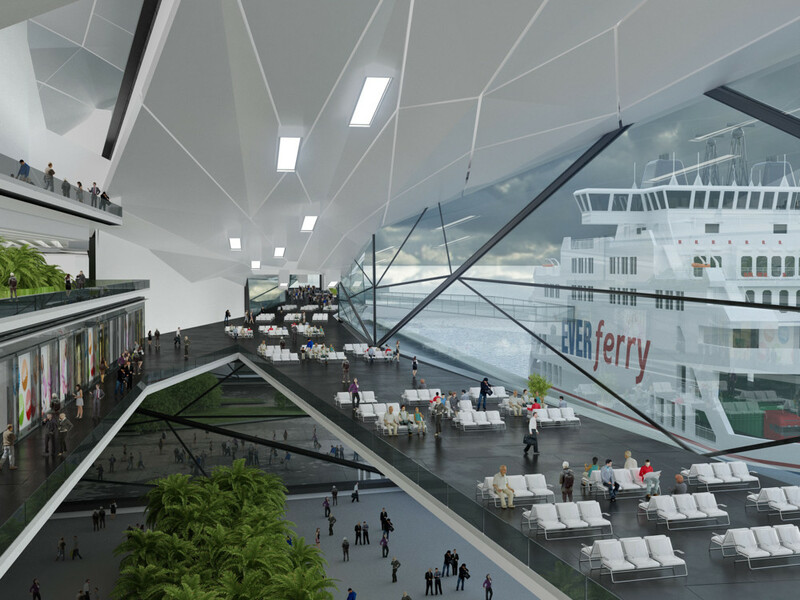 The Glass Canyon and Covered Piazza also allow for natural air circulation and intense heat and humidity dispersion, while also providing natural shade and glare protection for arriving passengers, and providing a better energy flow in and around the Building. PROGRAM The Building program is organized into three main sections: 1) Passenger Access Spaces 2) Waiting and Commercial Spaces 3) Cultural and Exhibition Areas 1) The Passenger Access areas are functionally organized over the first two levels (Ground Floor and Level +12m). The ground floor on each side of the Central Piazza has the Arrivals, the Second level the Departures. Ancillary cafes and retail spaces are built around these areas to promote a culture of comfort and ease especially for short term and direct transfer travelers. 2) On Levels 3 (+24 m), 4 (+30m), 5 (+36m) are located the VIP and long term waiting areas, which offer passengers in transit and waiting for a few hours the comfort necessary to enjoy their stay. These areas include larger shopping and store areas, cafes, high end restaurants, lounges, resting and bathing areas, exercise rooms and business lounges. 3) Lastly, the Exhibition spaces, located within the Museum volume extending over the park are also accessible for the Passengers and will host several different “curated” shows. This will be a unique opportunity for International and Foreign Passengers to learn about the history, culture, heritage and art of Kinmen and bring this knowledge and information to other countries and cities around the world.